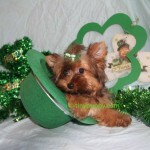 Golden Sable Yorkshire Terrier with Chocolate Yorkie Bloodlines. Oh My! This baby boy is just too precious for words. A rare Golden Chocolate Yorkie he is. This is little Murphy. 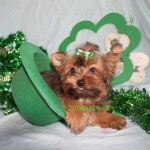 Murphey is just 3 lbs and is almost 4 months old. He is Gorgeous. Very beautiful colorings. 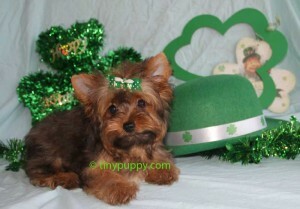 Little Yorkie Murphy has the Pastoral Champion lines in his mother’s bloodline. His coloring comes from his Dad. Just Beautiful.